You forgot to download Cute Reminder Standard	. Click the link below to download it. To make sure you don’t forget about important things, you should write them down. There are two ways you can go about it. You could do things the old fashioned way and put down notes, ideas, and reminders on post-it notes and stick them to your monitor. Or you could do one better and use software for the task, like the Cute Reminder Standard application. Instead of cluttering your monitor with post-it notes, you can post notes and ideas on your desktop. And on top of that, Cute Reminder Standard will notify you when you set up a reminder, something a traditional post-it note could never do. The Cute Reminder Standard installation file is only 2.9MB in size. The installation process isn’t more complicated than clicking “Next” in the setup wizard window. It must be mentioned here that Cute Reminder Standard provides support for multiple languages; you will be asked to choose between English, French, Spanish, German, and a few other languages. To remove the sample note and idea, right click their respective windows and select “Delete” from the context menu. To delete the sample reminder, hover the mouse over it and click “Delete.” To create a new note, idea or reminder, you need to access the Cute Reminder Standard quick access panel that sits hidden away in the right hand side of the screen, or you can access the Cute Reminder Standard Control Center. By accessing the Control Center, you can do a bit more than just create notes, ideas, and reminders. You can view a schedule of all your reminders and you can play with the Preferences. This means you can change the color scheme the application uses, change the application’s skin, change the audio notifications the application uses, specify the time when you want your ideas to show up on the desktop, and more. A registered version of Cute Reminder Standard can be used for as long as you want; it lets you set up an unlimited number of notes, reminders, and ideas, and comes with a nice selection of skins. The trial version can be used for free only for 30 days, displays nag screens, comes with only three skins, and limits the number of reminders, notes and ideas you can set up. 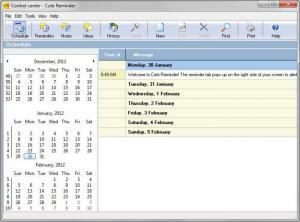 There are two other versions of the Cute Reminder application. On top of the Standard version there’s the Professional edition (comes with keyboard shortcuts, filtering and ordering capabilities, import and export functions, and an improved user interface) and the Enterprise edition (comes with communication capabilities over a local network). Cute Reminder Standard provides a handy and efficient way to set up reminders and write down notes and ideas. It’s an easy to use application that can prove to be quite useful. Besides English, the application provides support for French, German, Spanish, and other languages. Works on Windows XP, Vista, and Windows 7. Write down notes and ideas, have them displayed on the desktop. Set up reminders and Cute Reminder Standard will display a visual notification and play an audio notification to remind you. Customize the interface with skins and by changing the color scheme. Handy quick access panel sits in the right hand side of the screen, hidden out of sight. Free to try for a 30-day evaluation period. Cute Reminder Professional and Enterprise have more features. You can download Cute Reminder Standard free here.